Sometimes, pork just wants to be elegant. Don’t get me wrong, pork does enjoy being in the comforting, homey dishes like pulled pork and pork chops, or more often in our house, pork stir fry. But every now and then, the mood strikes, and it has the desire to put on its frilly dress and head out to the gala. So we let ground pork mingle with a juicy mixture of scallions, ginger, and Serrano, then wrapped them up in wonton wrappers and baked them into some fancy, flowery dumplings. A lime and soy ginger sauce gives it a final adornment on its way to the ball. 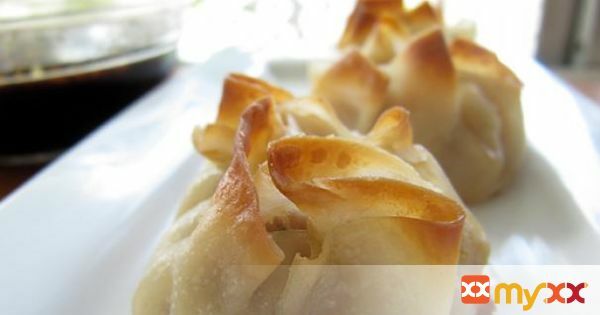 These dumplings do a great job of being juicy on the inside and crispy on the outside, without any need to fry in oil. 2. Grease two muffins, as these make about 20 dumplings. 3. In a medium-sized bowl, mix the ground pork, garlic, scallions, ginger, and Serrano pepper with a fork. 4. In a small bowl, whisk chicken broth, soy sauce, sesame oil, canola oil, and lime juice. 5. Pour the liquid mixture over the ground pork mixture and mix together with a fork. 6. Cup a wonton wrapper in your hand, then scoop about a tablespoon of the pork mixture, and place it in the middle of the wrapper. 7. Bring up the sides of the wrapper and sort of twist them together, then place in the cup of a muffin tin. 8. Repeat until all cups are filled. 9. Bake about 15 minutes, until you see a nice golden exterior. 10. While the cups bake, mix together the dipping sauce by whisking all the ingredients together in a bowl.